This rod is available in both 11 foot and 12 foot format. The “Harrison” Blank is constructed from a clever blend of High Modulus, High Strength and Multi Modulus Carbon Fibres. The Blank is normally available in ground or lacquered finish in "natural" colour finish. The Blank is a fairly fast taper but not too stiff. The result is that a rod with a nice sensitive tip but with huge power reserves can be constructed. The test curve is 1lb 12 ounces A full cork handle with Fuji DPS Reel Seat is fitted as standard. The whole handle assembly measures 23.1/4" overall. But can be made to any length. We fit 2.1/2" of cork above the reel seat. The rod is normally tied in black with subtle gold trim. A hook keeper is fitted as standard. Seymo 247S double leg standoff Alluminia Oxide rings are fitted as standard. The rod is supplied in a cotton drill rod bag as standard. As always we can change the specification to suit all requirements. As most of you older posters on another site may remember, a couple of years ago I had an unfortunate accident with a car and a rod hold all. We won't go over old ground suffice to say that I ended up with 3 custom built “PEREGRINE” Gti's (courtesy of the insurers). 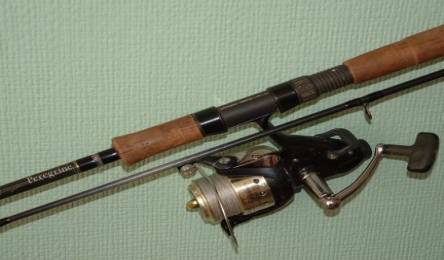 My rods are the 11ft versions and as you can see from the state of the rod and reel I do not treat my gear kindly, there is ground bait in the reel fitting and the cork is filthy but it all still works. You can see from the photo I had flat backs put on the cork handles (same as the Diawa range). 4 years on and lots of barbel later, I have found the rods superb there all round ability as river rod is in IMO unprecedented. I originally used them with Shimano 6000 baitrunners but found them unbalanced when playing fish, so I swapped the reels for 5010 and the balance was perfect. The last 6 months they have been coupled with Okuma Fb 40 baitrunners reels coupled with 20lb BS “Power Pro” braid and whether roving or static they have been perfect and for “touch ledgering” the balance is superb. I did catch 2 barbel while using the “PIN” with them. I have fished with weights from 1/2oz bombs to 8o zs method feeder (underarm lob) with them and never found them wanting at all. (Sorry Roger never told you about that!) Bite detection is superb whether holding the rod or static in the rod rest. Playing fish with the rod is a joy to behold and as Tom can vouch for, it handled his “double” brilliantly, because of the through action of the rod you can feel every lunge of the barbel but still feel in perfect control. No extended fights here but still no fear of hook pulls. I did break a guide (my own fault) and this was replaced. The mice in the garage took take a liking to part of one of the cork handles (even crawled down inside my hold all to get to it). Over all a superb piece of custom-built equipment. Price £170 Dependant on custom finish.